Although the model performance is influenced by the combination effects of all parameters, some parameters do have stronger impacts than the others. In practical applications, obtaining parameters that meet all requirements is challenging and often constrained by limited time and resources. Knowing the parameter that has the most significant impacts on the model would benefit model users by prioritizing the efforts on the most important factors. Therefore, a sensitivity analysis was conducted on the three major parameters in the model (i.e. 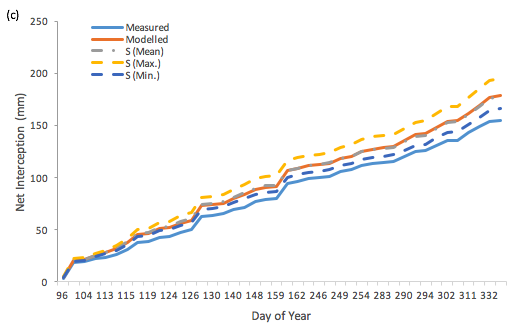 evaporate rate over rainfall rate (E/R), canopy water storage capacity (S), free throughfall coefficient (p), using the mean, minimum, and maximum values of each of the parameters obtained from previous study (Link et al., 2004). Figure 4a, 4b, and 4c illustrate the results of the sensitivity analysis for each of E/R, p, and S. Among the three major parameters, the E/R ratio is the most influential parameter in the model (Figure 4a). In Figure 4a, the pattern of cumulative interception was amplified by the maximum value and smoothed out by the minimum value of E/R. 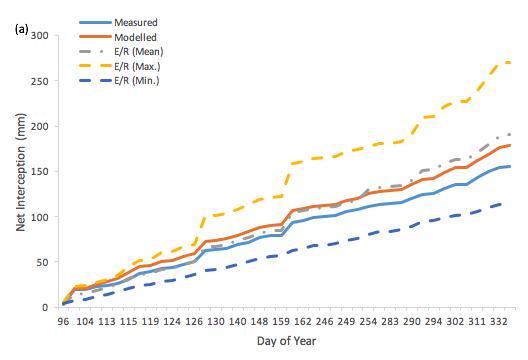 It would be intriguing to know which one of E and R has a more significant impact on the model results. 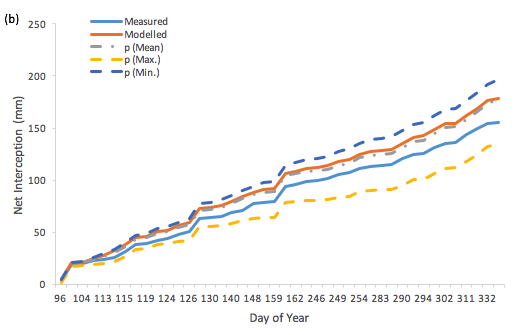 Unfortunately, with the current accessibility of data, it was not possible to separate the effect of E and R.
Compared to E/R, the model shows less sensitivity to both p and S. The maximum applied p value leads to a higher degree of departure from originally modelled value. A maximum at 0.73 of p means that 73% of rainfall on the tree directly reaches the ground without touching leaves and branches, which would imply only minimum canopy cover in this case. The influences of canopy parameters should be restricted to the period of canopy wetting up and the amount of water left on the canopy after rainfall has ceased (Gash and Morton, 1978). (See equations in Interception Calculations). Low sensitivity of canopy parameters for this analysis could also reflect the rainfall and evaporation characteristics over this study period. Figure 4. Sensitivity analysis for E/R, p, and S with the mean, maximum, and minimum values applied.